The Ministry of Commerce and Industry has recently released the Executive Regulations to the new Companies Law no. 25 of 2012 (the “Companies Law”). The Executive Regulations were issued to clarify and set out certain requirements necessary for the enforcement of the Companies Law. This article provides a brief overview of some of the key changes and additions to the Companies Law. Non-Profit Companies have been introduced under the Companies Law which can be utilized to address various social interests and allows for the establishment of companies whose main objectives are carried out on a non-profit basis. The Executive Regulations have extended the list of activities that a non-profit company is forbidden to undertake, including (i) political, religious, ideological, sectarian activities; (ii) activities contrary to public order or morality; (iii) the shelter of children, the elderly, and the disabled (unless the necessary permission by the relevant authority has been granted); (iv) the issuance of bonds and negotiable instruments; and (v) the distribution of its revenue or profit directly or indirectly to any of the partners or shareholders. The Companies Law introduced another type entity which is the Professional Company. The Executive Regulations have added the specific professions that may establish as a Professional Company, as well as the details related to professional insurance. A Professional Company may include attorneys, accountants, physicians, engineers and consultants licensed to practice. In order to ease the process of establishing a company under the Companies Law, the Ministry of Commerce and Industry is the sole department in charge of quickly undertaking the process and issuing the relevant licenses for companies. As such, the Executive Regulations have provided an abundance of information in regards to certain departments that will be established within the Ministry of Commerce and Industry to ensure efficiency and compliance of policies in connection with the formalities, thereby providing a “one-stop shop” for the establishment and licensing of companies. Under the Companies Law, the specifics as to the minimum capital for certain companies awaited the Executive Regulations. The regulations provide that the company’s capital shall not be less than the minimum capital amount set out in a comprehensive guide book of commercial activities for companies issued by the Ministry of Commerce and Industry. 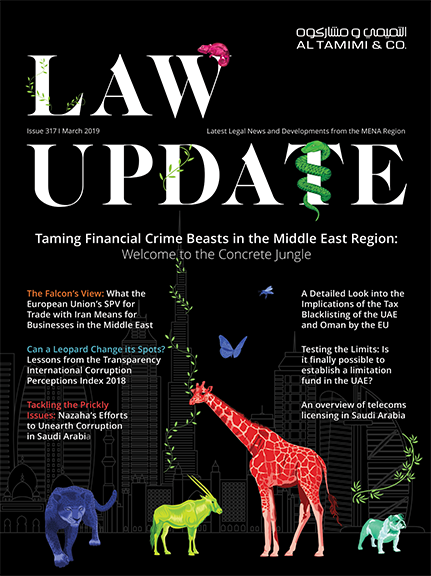 Although present in the old law, in the past corporate governance provisions, oversight and enforcement in Kuwait was often limited and led to feelings of insecurity and trepidation with respect to foreign investors who were considering whether to conduct business or invest in Kuwait. To address this, the new Companies Law includes notable concepts of corporate governance, the designation of responsibility accountability, and transparency. As such, the Executive Regulations includes that every concerned party may access the company records and documents, minutes of meetings etc., which can be found at the Ministry of Commerce and Industry. To do so, a concerned party is required to complete and submit an application which includes a small fee to the ministry. The Executive Regulations includes a wealth of information. Although we have only touched on a few items in this article, in the future, we endeavor to provide you with further insight to the regulations. However those doing business in Kuwait should be aware that Article 3 of the Executive Regulations requires existing companies to abide by the Companies Law and the Executive Regulations within one year from the date of the publication of the Executive Regulations, which was on 6 October 2013. The business community will welcome the Executive Regulations of the new Companies Law as it continues to modernize the economy by updating various issues related to current economic and business concepts that have been introduced to the corporate world over the past decades.